Hello, I'm.... Not mine, but pretty awesome, no? =). Wallpaper and background images in the Critical Analysis of Twilight club tagged: hello i'm cullen hale family twilight anti name tag. This Critical Analysis of Twilight photo might contain аниме, комиксы, манга, анимационные фильмы, комикс, мультфильм, and книга комиксов. Laughing @ some of the above reactions. 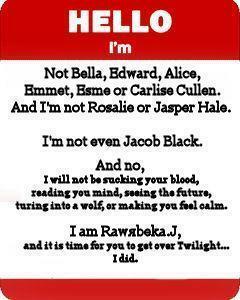 TEAM EDWARD!!!! is the best all the vanpiers r the best!!! !